King Pravardhana was ruling the Pataliputhra Kingdom. He had a beautiful wife Nalini Devi. The royal couple were blessed with a son Vijayaditya. Prince Vijayaditya and minister's son Suguna Varma were brought up and educated under one master. This association transformed them to be closest ever pals, since childhood. They were always moving around and doing things hand in hand. With their activities, Vijayaditya and Suguna Varma were reputed in the populace as future King and Minister of the Kingdom. Vijayaditya was overtaking Suguna Varma with his strength and expertise at martial arts, while Suguna Varma was showing upper hand in intelligence. The love and affection among them were only growing with the passage of time. One fine day both of them went to the close by forest for hunting. Both were tired with strain after spending hours in hounding. Suguna Varma told the prince, Dear Friend! Vijayaditya! I am very thirsty and my throat is drying out. Let us find some water to drink. Vijayaditya responded immediately, Yes Friend! I am in a similar status well let's find some water source and both of them drove their horses to a distance where they found a pond. Satiating their thirst, both rested under a tree. After sometime, a tune filled song was heard. Vijayaditya first opened his eyes and gazed towards the pond. He forgot to even blink his eyelids. A beautiful young woman was singing and bathing in the pond along with her associates. Vijayaditya was totally moved and rocked for her splendour of body and voice. Meanwhile, Suguna Varma woke up and was smiling looking at the Prince's state of mind. Vijayaditya rose and stepped towards the pond. No sooner he reached the pond, just that moment the bathing beauty emerged from water and was walking towards him. Their looks met and it was love at first sight. 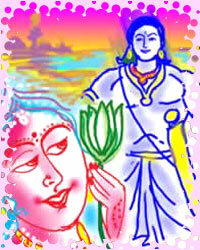 As her associates were reaching close, the attractive woman pulled out a lotus from her hair. She first touched Chandraharam (an ornament), then once her head, her feet and finally walked away briskly touching her breast with the lotus. Vijayaditya was agonized after she left. Suguna Varma grasped the reason for his looks. He asked, Dear Friend! Why are you worried even after she gave her invitation to you? What? Suguna Varma Vijayaditya questioned, how did she invite me? What is the proof for it? Suguna Varma replied, Friend, without her associates noticing, she expressed her opinion through her actions. I will explain you what were they. Prince hurried his friend, Quickly tell me! Suguna Varma started, First the lady took out Lotus from her hair and touched her Chandraharam to tell you that she is from Chandrapuram. Then immediately she placed the flower on her head, which means she is princess of that Kingdom. Touching her feet with the flower, she tells her name to be Padmavathi and lastly she touched her breast with the flower, which conveys that she is in love with you and wishes to hug you. Her brisk walk was to extend an invitation to you for meeting her as early as possible. Prince was bubbling with joy on hearing all this. He immediately proceeded towards Chandrapuram taking Suguna Varma along with him. They stayed in a house belonging to a old woman as paying guests. They convinced the old woman luring her with sizeable amount as gift, if she took the message of their arrival to the princess Padmavathi. With great effort the old woman could reach the Princess in the royal palace. She submitted humbly to the princess about the purpose of her visit to the palace, Respected Princess! The prince and his friend whom you saw near the pond are now housed with me. I am here to convey this message, on the request of the visiting Prince. Princess Padmavathi was internally jumping with joy on hearing the message, however she expressed anger externally, You! Old Woman! I feel mercy on you for your age. Otherwise, you should have been beheaded by this time for bringing such messages to me. Now, I warn you not to bring any such information to me in the future. One more time I see you, you will directly ascend the deathbed and leave. The Old Woman was taken aback and started shivering out of fear, Kindly pardon me Princess! The money they offered attracted me. Forever I will not do such acts she prayed. The Princess later made the Old Woman sit in a big basket and tied a rope to the basket. The basket was slowly descended on to the ground from the window of the Princess room and was asked to leave. Narrating the entire happening to the guests, the Old Woman pleaded, Look young men! At this stage of my life, I should not have done this. Nevertheless, lured by the amount you offered I had risked my life and was close to death. I will never do this again even if you are going to offer anything. Vijayaditya was depressed on hearing the Old Woman and gave a stale look towards Suguna Varma. Surprisingly, Suguna Varma was smiling on hearing all this. Dear Friend! Vijayaditya! Princess Padmavathi is very intelligent. She is communicating through her actions, which can never be understood by common persons tactfully. She pretended in front of the Old Woman as if she is innocent and at the same time she conveyed how to reach her. In the midnight darkness if you vibrate the rope coming down from her room's window, she will know about your presence and pull you up to her. Hence, you have to go to her this night. As soon as Suguna Varma stopped explaining, Vijayaditya appreciated him, Friend! I should thank you for a lifetime. If it was not you with me, I could never understand all this and hugged affectionately. The same night in the wee hours Vijayaditya reached the rope and vibrated it. Watching the movement of the rope from inside the room, Padmavathi immediately came close to the window and peeped down. Signalling him not to make any noise, she carefully pulled him along with the basket and Vijayaditya entered her room through the window. They started spending time with each other all in isolation for days together with love flowing around them. Unnoticed, for the loving duo, days were passing off. One day Vijayaditya remembered his friend, My Dear Love! I remember my friend Suguna Varma. I will go once and enquire about his well being in the Old Woman's place. It was long to see him. Princess Padmavathi could not digest the matter that the Prince wanted to leave her for one friend, My Sweetheart! I cannot live without you even for a minute. Is that fair for you to leave me? Please stay for some more days and then go to see him. Vijayaditya was hurt with her behaviour and could not move as freely as earlier. Padmavathi understood his behaviour that he was worried about his friend more than her. She decided to eliminate the hurdle of Suguna Varma in between them and planned for an extreme strategy. As part of it, My Sweetheart! Here are some sweets for your friend. I give you swear on me if you consumed any of these, as they are only for him. Take care of his well being and bring him here along with you on return. Vijayaditya was happy over her actions, descended from the room during early hours of the day, and walked straight to the Old Woman's house carrying the sweets. My Friend! How are you Suguna Varma? Is everything alright? Vijayaditya hugged his friend. Suguna Varma replied, What happened to me? I am very fine. It seems that your endeavour is fruitful. I am very happy to see you in pleasures. Vijayaditya narrated all the happenings from his entry into the room to the exit and handed over Suguna Varma the sweets sent by Padmavathi. Dear Friend! You should not have informed her about me that I am waiting for you. These sweets are only to distance us permanently said Suguna Varma. Vijayaditya objected to this, You are mistaking Padmavathi, she is a righteous woman. She wished to felicitate you if I take you along with me. Suguna Varma stopped Vijayaditya, Dear Friend! Don't be so fuming on her. It was only her love towards you that made her to resort to this step. I do not see any other reason. She never wanted to lose you because of me. That's all is the matter. What ever it is, now we should not live here any more. We should take your love Padmavathi too with us to our kingdom. Vijayaditya agreed his friend's view. Suguna Varma told him, Dear Friend! Listen carefully do what I say and do just like that. As usual you go to her room this night too. With normal behaviour you spend time loving her. Once she is fast asleep, make three small wound cuts on one of her breasts and bring her gems-studded necklace. The rest of the story. I am here to manoeuvre it perfectly. Now go. Vijayaditya followed Suguna Varma's plan and did as was said. On his arrival, Suguna Varma made Vijayaditya agree to take the guise of his disciple. Suguna Varma himself wearing a saint's guise explained Vijayaditya to get into the town streets and show it to everybody. Vijayaditya was asked to bring the person who demands the necklace to him. I will be sitting in the nearby grave yard. You just tell the person or persons who ask for this necklace that you don't know anything and to speak to me. Immediately Suguna Varma left to the graveyard and Vijayaditya started roaming in the streets showing the necklace to everyone. The news of a saint roaming in the streets with a precious gems-studded necklace reached the king and asked his soldiers to present him in front of him. Soldiers took Vijayaditya to the palace. The king questioned him, What is the value of this precious necklace, Saint? With no single letter exceeding Vijayaditya replied, I do not know about that, King! You should ask my master. He is in celestial chant sitting in the nearby graveyard. The king along with some courtiers and soldiers went to Suguna Varma in the graveyard and asked him to give the necklace. Suguna Varma answered, King! You can take the necklace. You do not have to pay any price for doing so. However, I wish to keep you informed that I am in the sacred chant here for quite some time. A beautiful woman was regularly coming here to feed herself on the corpses. She is a demon in human form. Yesterday night, I poked on her breast and pulled this necklace from her. He continued, if this lady demon lives in your town she is going to create a havoc in your kingdom. Find out who is this woman and no mercy should be shown even if she was your daughter. However, I would suggest you that killing a woman is one of the biggest sins. Hence, blindfold her and leave her in the forest close by. The King returned to the fort and summoned the minister to find out to whom the necklace belonged to. The minister examined the necklace closely and to his surprise the royal palace marks were found on the necklace. He then straight walked into the palace and enquired about the woman who used to wear that necklace. Another surprise hit the minister. The necklace belonged to the Princess Padmavathi. The King was informed about this. King sent an order to Princess to appear before him immediately. After the Princess came, the King ordered the maids of the court to examine whether the Princess had injuries on her breast. The maids revealed that the Princess had three wound cuts on her breast. Furiously and with all the pain, the King ordered, blindfold her and leave her in the middle of the forest near by. The soldiers did in conformity to the King's order. Suguna Varma and Vijayaditya knew about this, removed their guises and headed towards the forest. They met Padmavathi there and took her to their Kingdom Pataliputhra where Vijayaditya married Padmavathi and lived happily forever. Bhethala stopped his story here and questioned, King of Kings! Vikramaditya! You heard the entire story. Now tell me who is the sinner here. Vikramaditya, with his natural royal smile, Vijayaditya is a dynamic young man. There is no fault with him for loving Padmavathi. Padmavathi was equally attracted to the young man and spent her time with him secretly in her room. Therefore, she cannot be blamed. Even Suguna Varma is not at fault, as he performed his responsibility as a true friend. Vikramaditya added, The King of Chandrapuram and father of Princess Padmavathi is at fault. This is due, the King did not inquire into the happening properly and hence, should bear the sin of abandoning his child in the forest.